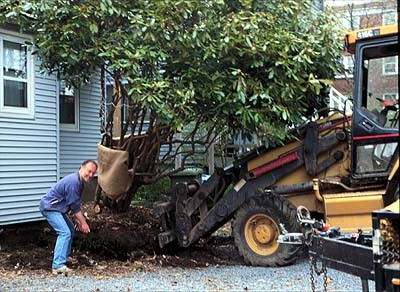 Atlantic Rhododendron & Horticultural Society - Maximum Move! 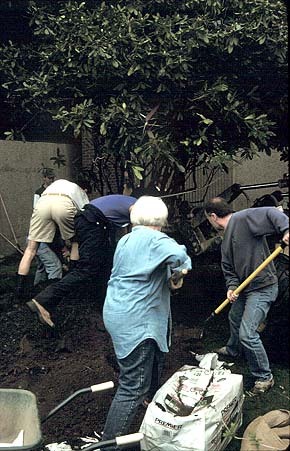 The rhododendron in its original location. 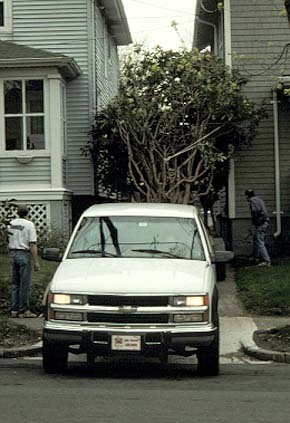 Unfortunately it had outgrown its home – note the entrance way to the door pruned into the left-hand side. 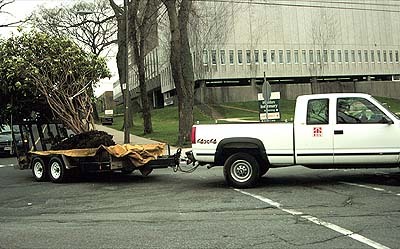 One weekend in May ’99, RSC Atlantic Region undertook what was probably the largest rhododendron move ever in Atlantic Canada. 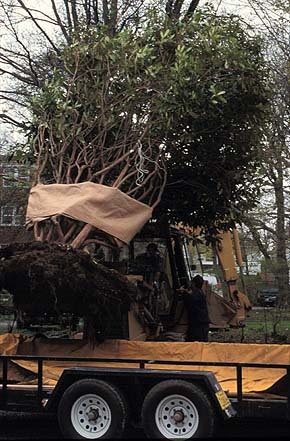 The rhododendron was lush 16′ high x 16′ wide Rhododendron maximum. 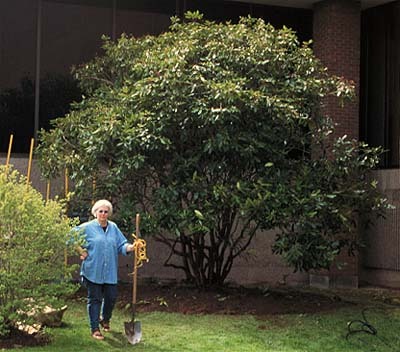 It was donated by Ms. Debbie Denoon who inherited the plant when she purchased her Oxford Street home. 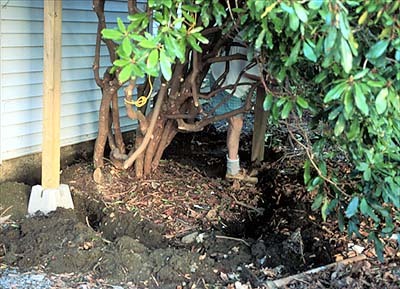 Realizing that it had outgrown its home against the rear of her house, and remorse to cut it done, she contacted RSC Atlantic Region. 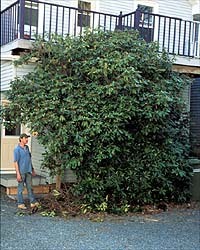 In Roland’s Flora of Nova Scotia, it is reported that Rhododendron maximum, a species, was discovered growing near Sheet Harbour in the late 1800’s. It has never been documented growing naturally in Nova Scotia since. 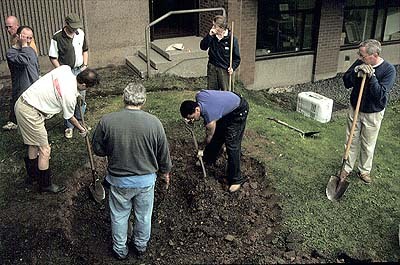 For this reason, it was decided the grounds of the N.S. Museum of Natural History would make an ideal new home. R. maximum, in nature grows in the bright, sheltered understory of forest trees. 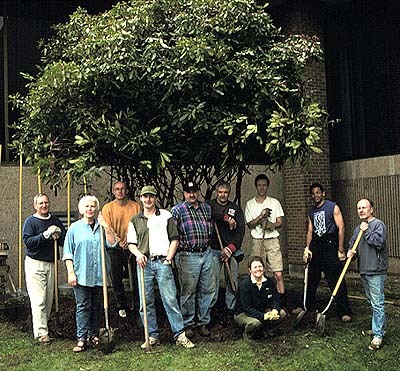 To mimic this habitat, a northeast facing protected alcove was chosen at the rear of the museum. Thanks also to Eisener Contracting Ltd. for donating the front-end loader, operator and trailer, and the many volunteers who assisted in the move! 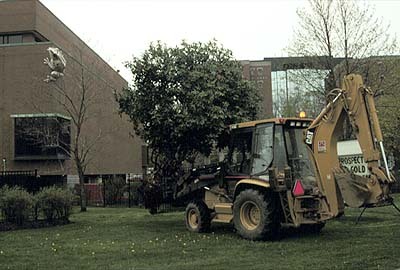 The rhododendron may be seen at the NS Museum of Natural History, 1747 Summer Street, Halifax. An ideal time to visit is in mid-July when it covers itself with trusses of pale pink flowers.